To customize this template after signing up, choose ‘Consent Form' as example when creating a new survey. based on an explanation of the proposed research and the nature of the participation that is requested of them. It should be descriptive and not overly technical. A Consent Form gives written permission to another party that they understand the terms of an event or activity that will be performed. When agreeing to consent, it must be done so voluntarily with a competent mind. A subject can revoke their consent at any time and this decision should be respected. How to Give and Accept Consent? Obtaining consent is due to a service or agreement that needs approval by the subject which then gives permission for the research to be carried out. Consent is not required in all situations. For example, a person going to the doctor to have their blood pressure measured is a form of treatment but not in the sense that it needs special approval as the treatment does not pose any risk to the patient. If you are offering a service and have doubts about whether or not you need consent from recipients of that service, it’s always best to contact a lawyer for advice. Once you know the exact permissions you need when offering a service, it’s time to obtain the right consent form for your needs. A consent form should be specific and clearly describe the permissions and services that are to be conducted. Consent should never be given or trusted verbally, always be certain that you have written consent. If you are a photographer needing consent from models, your consent form will differ from a landlord needing a background check on a potential tenant. Any consent form must be signed in order to be valid. It’s the responsibility of the recipient to know the risks involved when giving consent. Prior to signing a consent form, ask questions if you need more detailed information. Why use Survey Anyplace as Consent Form Tool? Let people sign the consent form both on- and offline. ideal for people who work remotely. Integrate your consent forms with all your favorite apps or tools via our Zapier integration. We at Survey Anyplace realized that paper reviews and forms are slow, messy and most of all, a thing of past. So we made all our software mobile optimized to ensure your consent forms run smoothly and effortlessly. 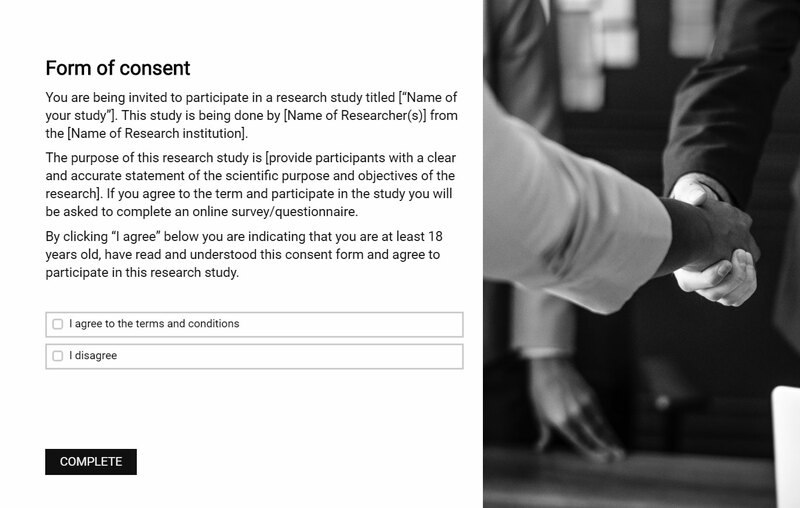 To use this consent form template, sign up for Survey Anyplace , and choose ‘Consent Form’ as a template when creating a new survey. Informed consent is not merely a form but a process. All necessary information must be clearly present and defined so that the person can make an informed, voluntary decision about what they are agreeing to. This involves informing about possible risks, extra costs and the purpose your permission is needed for. Minimize the passive voice to the extent possible, use “we will send you the results”, instead of “the results will be sent to you”. It is important that the consent form approvals are easy to understand, distribute, collect and organize. Online consent forms are far more efficient. Mobile devices such as a tablet or smartphone are ideally suited for this task. All our forms and surveys are mobile optimized to provide the most user-friendly experience we can offer.